The St. James Chamber of Commerce is an organization of local businesses working in a cooperative effort to promote an environment that creates business, economic success and enhances the St. James community. Deepwells was built in approximately 1845 for Joel L.G. Smith (1819-1875), a descendant of Richard “Bull” Smith, founder of Smithtown. He bought the Deepwells property from Gamaliel Taylor, who was also a member of the Smith family. The property was a working farm of just under 50 acres, bisected by North Country Road. There are a few buildings that remain standing, including a small frame well house and a laundry garage, both built in the 19th century. 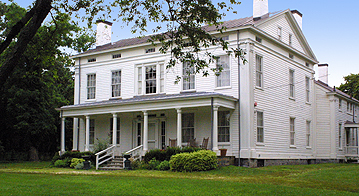 Deepwells Farm County Park is owned by Suffolk County and is dedicated to the Suffolk County Historic Trust and listed on the ‘National Register of Historic Places’ in Washington, D.C. 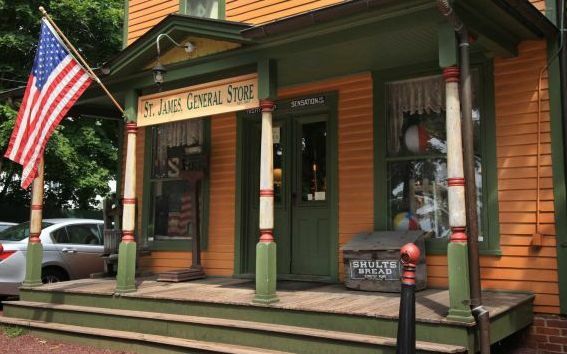 In 1857 entrepreneur, Ebenezer Smith, a descendent of Richard “Bull” Smith of Smithtown had the St. James General Store built In the heart of the business district. This is where the residents purchased their yard goods, kitchen wares, medicine, shoes, horse medicine, tobacco, groceries, hardware and more. The post office also located in the store, made it a central meeting place. Upstairs dances and parties were held and the first telephone was installed here. Through the years each owner preserved the store as a piece of living history. In 1990 Suffolk County purchased the 133 year old store. The store today reflects the period between 1880 and 1910. 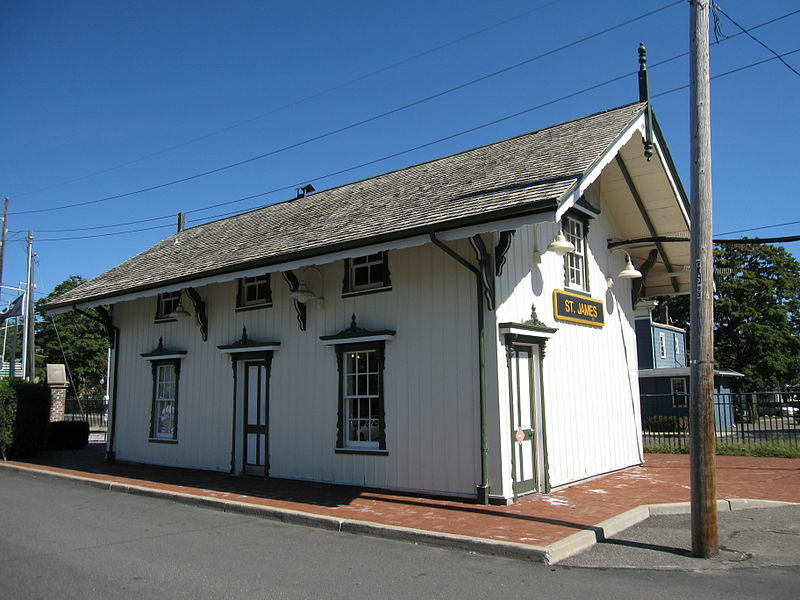 Opened in May of 1873, it began as a signal stop. The site of the present depot building was given by Edmund T. and Milton G. Smith, on the condition that the Station be located on the road dividing their farms. It also allowed for easy access to and from New York City, where many rich New Yorkers bought “farms” and built mansions on the North Shore of Long Island. In the days before air conditioning the theaters closed for the summer and actors went on vacation. St. James became a popular vacation spot for the stars of New York stage and screen and soon became known as the Actors Colony. The original house was built by Timothy Mills c.1700. 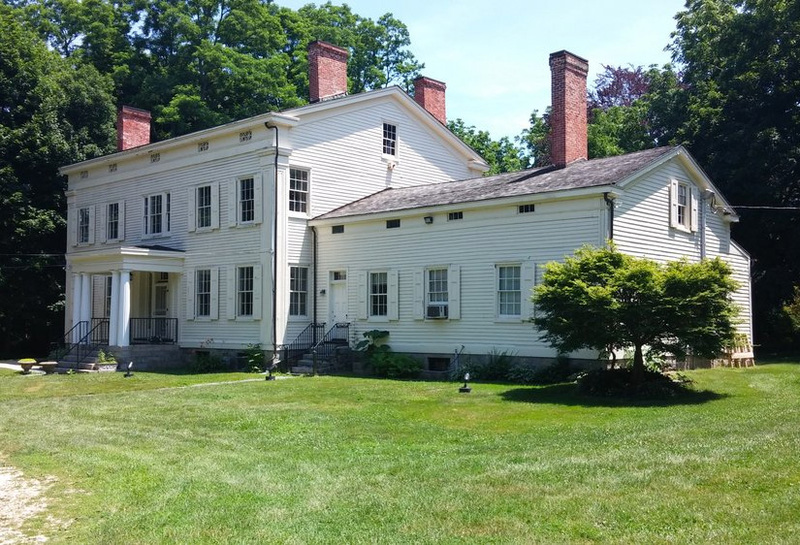 It was partially destroyed by a fire and in 1838 William Wickham Mills, descendant of Timothy, restored the damaged part of the house and added on a three-story addition. The house, designed by noted New York City architect Calvin Pollard, was passed down to Dubois Smith, grandson, and then to his two daughters, Josephine and Mildred Smith. The house was donated to the Town of Smithtown in 1976. Today the Mills Pond House is the home of the Smithtown Township Arts Council which exhibits of works of regional and national artists. They also offer art classes and hold a variety of special events throughout the year. Founded in 1853, the church, a wooden building of Gothic architecture, was based on designs by Richard Upjohn, and was consecrated on July 3, 1854. The church features one Tiffany stained glass window and three windows designed by Stanford White and created by John LaFarge. 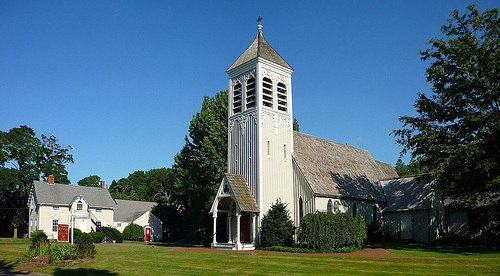 The cemetery, located directly behind the church, is the final resting place of many of the founding families of the Town of Smithtown, as well as of Stanford White, Whitman Knapp and Patrick Dennis.